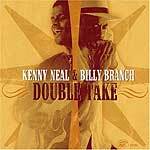 Longtime fans of Kenny Neal know that the Louisiana bluesman is as capable on harmonica as guitar, so finding him playing with Chicago harpist Billy Branch on this all-acoustic recording might seem an odd pairing at first blush. But in Branch, Neal has an equal in both skill and presence  providing him a foil that forces him to lift his already stellar playing up yet another notch. Recorded in France in 1998, "Double Take" is only now being issued in the United States. The 12 tracks take in a broad swath of covers of blues standards, a handful of Neal's own songs (at least some of which he's recorded before), and one song by Branch  plus a new instrumental that is likely a head arrangement composed on the spot. Trading leads on guitar and harmonica, Neal and Branch engage more in playful musical banter than in any real competition or one-upmanship. There's a relaxed feeling to the session, an air of two friends hanging together. The music they create is a likeable blend of Louisiana swamp boogie and southside Chicago blues. The two men mesh seamlessly, and the result is a recording that's one of the best either of them has yet issued.